Understanding mountain garments raises many questions. At the end of the 2016 TGO Challenge Mike intrigued Emily Rodway by saying ‘ We ask questions like why aren’t most rucksacks waterproof ?’ in Keeping Dry and Staying Warm. ‘I never thought of that’ was Emily’s reply, ‘tell me about it’, and the idea for a series of extracts from our book that would surprise people was born. These tasters are designed to tempt readers to find out more about elements of gear that make an enormous difference, but are often not explained or fully understood. 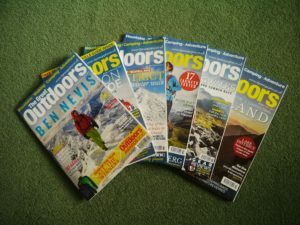 Inclusion of our articles, as a Questions of Kit series, complements TGO’s excellent comparative testing articles. Our book is based on very carefully researched ‘first principles’ and ‘core’ and ‘emerging’ technologies, plus the explanation of layering best practices. We provide clear explanations which avoid sometimes confusing terms used to market specific products.We benefit for the wide range of expertise from our writing team. This means our coverage is multi-sport and multidimensional. So what was included in our TGO articles? I remember when I was going round a trade show encouraging brands to attend our annual innovation conference, Innovation for Extremes, I started talking to someone on a sock stand. He was very friendly but said ‘ Oh I don’t think that is for us, we are only selling socks, nothing very innovative.’ We show in one article that socks are highly technical and are a sophisticated element of your layering system. 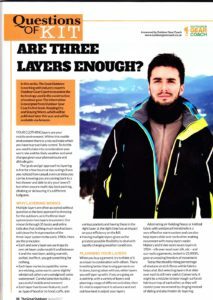 Layering is the very core of Keeping Dry and Staying Warm and was also included in our TGO series. Everyone is familiar with the three layer system and we challenge this suggesting that including more layers can give greater flexibility in a range of circumstances. The efficiency of layers depends on more than clothing because it includes metabolism and physiology as well. Hoods are vital to the effective functioning of waterproof jackets but are rarely fully explained, so we included an extract showing how they function and why they differ. Humans today are an indoor species with a recent study showing Americans spend 87% of their time indoors and a further 6% in a car. 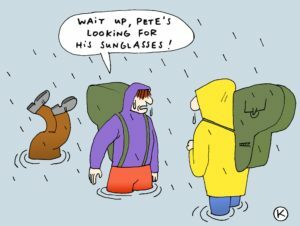 This trend has distanced the majority of people from the cold, the wet and the wild. Experience builds understanding and our book draws both on the wide experience of our team and on past and current narratives to help compensate for indoor lifestyles. Our final two extracts are based on the two part history of the waterproof jacket that we originally wrote for our website. Taking the long view of garments is important as it builds an appreciation of the relationship between textiles, their performance, their uses and how users understood them. We use stories and narratives to make the process of Keeping Dry and Staying Warm easier to understand, remember and apply.